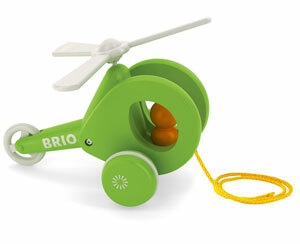 I was asked by Izziwizzikids.co.uk to review this lovely pull along helicopter by Brio. It is a simple small and compact toy, it is a perfect size for littlies to pull along. I love the colour, it is so bright and eyecatching. It is very well made and I have no worries about the sturdiness at all, I am expecting it to last and am not woried about any small bits, or anything falling apart! The propellers turn as it is pulled along, and as the box says, the faster you pull the faster it twirls! My kids love it, to the point that there has been a couple of ‘tug of wars’ over it! I love it as an addition to our toybox and I would buy as a gift too!